This basic biscotti recipe teaches you how to make biscotti cookies. I prefer using almonds but include variations for vegan and even gluten-free cookies! People who know me know that I love coffee! Morning, noon, night, it doesn’t matter, you can usually find me with a coffee cup in my hand. And what goes great with coffee? Biscotti! I had been buying it, but now I’m making my own biscotti recipe. Biscotti is a twice-baked cookie. Originally from Italy, they traditionally make them in long loaves, bake them, cut into cookies, then bake them again until crispy. They are thick and light, making the perfect texture to dip into hot coffee. Traditionally, they are made with almonds, but you can make any type you like. I include a few variations in the recipe below. 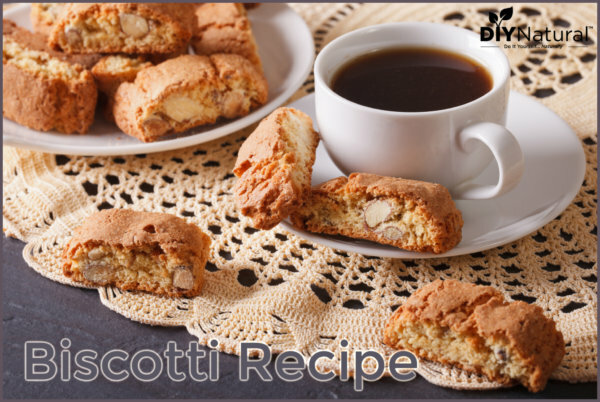 While biscotti is usually made with flour, sugar, eggs, and almonds, you can vary the recipe to achieve the results that you want. Here is the basic recipe. Mix together all the biscotti recipe ingredients except for the almonds. Once thoroughly mixed, fold in the almonds. When the almonds are incorporated, shape dough into a loaf on parchment paper. It should be about 2-3 inches thick and flatter on the edges. Bake for 30-40 minutes at 350°f and use a toothpick to see if it is done. The toothpick should come out clean. Remove from the oven and allow to cool for 15 minutes. Once cooled, cut 1-2″ thick pieces at an angle, return to the oven and bake an additional 15-20 minutes at 350°f. Cookies should now be crispy, which is just how you want them. Cool and store in an airtight container. See below for vegan and gluten-free biscotti recipe options. applesauce: use 1/4 cup applesauce for each egg. These substitutes work because the structure isn’t compromised by the lack of eggs. Eggs help make cakes and muffins light and fluffy, but biscotti cookies don’t need to be light and fluffy. Almost any gluten-free flour or meal can be substituted in this recipe because biscotti cookies don’t “stretch”. With bread, gluten is needed to make the bread stretch. Cookies, however, don’t need this quality, so most any flour can be used. Brown rice flour, chickpea flour, and even oat flour can be used. You can even use meals like almond meal. One flour that can be tricky is coconut flour. It can be used, but it absorbs a lot of moisture, so you may need to add a bit of water to the dough. Once you mix it, you’ll know if it seems very dry. Add small amounts of water at a time until you get a soft, shapable dough. You can also use ½ sugar and ½ substitute, but if you need to replace all of the sugar, try 1tsp stevia to start, and add more until you reach your desired sweetness. You can also swap out the oil. In my original biscotti recipe, I used cooking oil, but I have since eliminated that from my kitchen, so now I use coconut oil. I melt it first so I get an accurate measurement. You could also use safflower oil, sunflower oil, or any other light oil. You could also swap out some of the oil for applesauce. A lot of recipes successfully substitute applesauce for oil. Lastly, you can substitute just about anything for the almonds. I love golden raisins, figs, dried cranberries, pecans, filberts, chocolate chips, or whatever you want. Experiment and find what appeals to you! Have you ever tried to make a biscotti recipe? Why not try a batch today! See all our dessert recipes here. Almond Biscotti Recipe: Vegan & Gluten-free Options was written by Debra Maslowski.